Hi. My name is Andrew Webster - a 63 year old Yorkshireman. Married to Yvonne with four beautiful children - aged 22 to 32, who sometimes stay in the cottage with friends. We have been visiting this part of France for 40 years and have owned our holiday home in Ste Maxime for fifteen years now. We love it there, as I am sure you will. A past president of rotary international with worldwide travel experience, a boating enthusiast with a small Sunseeker in the harbour. Being retired, I am often there just staying on the boat, especially when the cottage is occupied. Therefore, I am able to offer personal help/advice to those visiting for the first time - but only if required! I hope you enjoy your time in Sainte Maxime, a place we have come to love! Having first visited the area in 1976 for the Monaco Grand Prix, my then fiancee and I returned year after year. Each time visiting different areas of the Riviera from Monaco to Marseille and inland to the Luberon, Gorge du Verdon, Arles / Aix / Orange etc and also several times skiing in the Alps - only two hours drive away. Loving the sea & boats, we decided the best area was the Bay of St. Tropez - it had all we wanted and there is so much to see & do. Yes, busy in Summer but that was only six weeks of the year! The rest of the time its near perfect. Although I am not a golfer, there are three courses in the area which should suit most tastes. Also, a horse riding school - just two miles away. If you like diving, then the port itself offers two diving clubs. Plus a mini submarine! Staying at the Cottage - means you really do not need a car! You can walk or ride anywhere in the town to all the shops, restaurants and markets. It has a lovely Church and by contrast, a Casino. The town beach is minutes away and to swim first thing in the morning before breakfast is a real treat. The harbour is virtually on our doorstep and the ferry takes you to St. Tropez every 30mins (which is the best way to visit this famous town) No cars, no queuing! Ste Maxime has some excellent restaurants, we have been visiting since 1976 and still not been to them all, there are so many! 150 in fact. Great for kids too, with swimming, snorkeling and diving. Water Park and Tree Adventure Park. Lots more in the area, go karting & jet skis etc etc. One bathroom and one shower room - both with WCs. Both are modern and fully tiled. Aircon to the ground & top floors. First floor has fans. There are electric heaters on each floor. All beds will have clean linen ready for your arrival. Two towels per guest are provided. Open plan living / dining area approx 5mx5m, with sat.TV and DVD. French doors open onto private rear cul de sac - where you can sit out. Selection of books / magazines / dvd's and a host tourist information leaflets. There are all the plates, cutlery, mugs and glasses you could possibly need. Plus all necessary pans and cooking utensils. Selected channels available, mainly English News programmes. On each floor At least 30 DVD films to choose from. Several Books/ Magazines on site. NO GARDEN but lots of plants in pots.....please water during your visit. Thank you! Boat Hire available in the Port. No Terrace...But private cul de sac to ground floor at rear...where you can sit out. It is possible to ski within 1 hours drive of the cottage - at 'Audiberg'. ( A small resort with views to the med - still pleasant when plenty of snow.) OR about two hours drive to either Foux d'Allos or Auron / Isola. Please ask for more help / info. if interested. There are three golf courses close by - the old course at Beauvallon, the new one in the hills behind the town and one at Gassin, Nr. St. Tropez. Notes on accommodation: There is air conditioning to the Master Bedroom on the top floor and to the Living Area on the ground floor. The first floor twin bedroom has no ac but is supplied with fans which have proved efficient at cooling the room. Pets allowed BUT only small dogs that won't bark, annoy the neighbours, damage the furniture or be left alone. Please make known when booking. Outside: The cottage is situated in a narrow cul de sac, opposite the hotel bon repos. There is no garden - but the rear lane is private and you can sit outside there. Small table and chairs are provided. There is no pool - but the med is five minutes walk away. Also, there is no parking by the cottage other than nearby local streets and the large port car park (3mins walk away) is 40 euros a week. Parking Office open 7days 8am to 8pm for advance pre-payment. Private parking close to the cottage can be arranged and booked in advance - please ask. Utility Room: There is a washing machine closet with ironing board / iron. Plus cleaning materials and clothes horse. Cleaning / Towels / Linen / Maid service: Clean towels and bed linen supplied after each rental. But not ironed! Fantastic....the cottage, the town, the whole holiday! Coming again. Perfect location,comfortable clean n tidy. Near to everything. One of the best value cottages we have ever stayed in. Will go again. Beautiful cottage in a super location, close to everything. Second visit here and we will come again! Nothing more pleasing than repeat bookings! We had a fabulous two weeks at this lovely cottage in our favourite place, Saint Maxime. The cottage had everything we wished for: excellent cooking and showering facilities; a charming little sitting out area surrounded by flowers and shrubs; a balcony with a view of the sea and passing boats; located right in the busy hub of the town with immediate access on foot to restaurants, the port, the shops, markets and the beach. Walking, reading, writing, drawing, local produce, eating out, and did we mention the excellent wines! For us, it was nothing less than perfect. Always very pleased to hear that a new client was not disappointed with the cottage and happy to write an 'unprompted' complimentary review! Have just booked again for our fifth year! We are returning for the fifth year which says it all! Love the cottage - it is in the heart of Ste Maxime - everything there you could want. Cottage was clean and well looked after - Ray and Martine, who looked after the cottage, were always there if we needed anything - would recommend it to a friend - thank you Andrew. Returning clients........'says it all' ! We've just returned from a wonderful week spent in the cottage in Sainte Maxime. The cottage is perfectly situated in the heart of the old town - beautiful cobbled streets, quaint shops and a provencal market - and seconds away from the marina and the beach. An even more stunning beach, Plage de la Nartelle, is only a short bus ride away. The cottage is beautifully decorated, clean and it was perfect for my family of three. The view from the balcony on the top floor, adjacent to the master bedroom, is breathtaking. Overall, a wonderful holiday and we plan to return in the near future! I am delighted with this review and even more pleased that Susan, Peter & Alexandra had such a great time - both in Sainte Maxime and Sainte Maxime Cottage itself! I sincerely hope they return - they would be very welcome! The town beach is less than 10 minutes away. Plus a selection of smaller beaches. The bigger and better beach at La Nartelle is a five minute car ride or thirty minutes on foot. New town Bus shuttle is only ten minutes and 2 euros. World famous St.Tropez Pampelonne Beach voted three times 'best beach in the world' is a good 40mins drive away. Or take the ferry and bus - easier in Summer! Nice airport is approx 50 miles to the east (about one hours drive). Toulon is 30miles to the west and Marseille about 70 miles. Europcar in Ste. Maxime for car hire if required, plus all airports. Nearest Train Station is St. Raphael for TGV etc - approx 10miles east. The bus to St Raphael takes about 40mins and costs only 3 euros. There is a bus from Nice airport to St Raphael four times a day and costs about 17euros. Then change at St. Raphael. The town mini bus is only 2 euros. 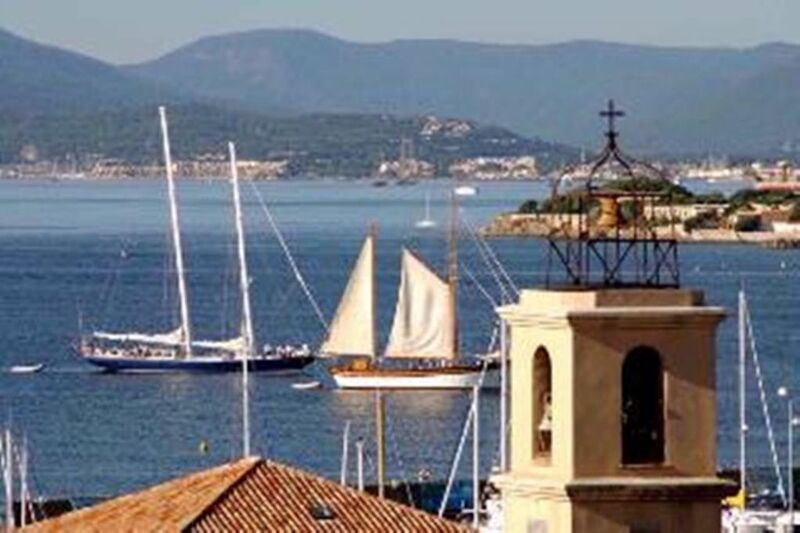 The bay of St. Tropez has everything you could wish for on a holiday and all local amenities are within 30 mins drive (longer in school holidays). Villages worth a visit within 30mins are Grimaud, Gassin, Ramatuelle, Roquebrun. Further afield - Gorges du Verdon, Lac St. Croix, Isles des Hyeres, Aix, Arles, Orange, Cannes, Monaco and Italy! All within a few hours max. Most only two or less. Plus a delightful selection of provencal villages North towards the Alps. The town has several mini markets, plus two hyper markets. There is a water park and tree adventure park on the edge of the town (only open in summer season). Plus two tennis clubs open all year round. Excellent shops and restaurants are literally on the door step. A new bus service 'SimpliCite' runs regularly around the town for only two euros all day and anystop including La Nartelle beach and waterpark. Visit the tourist information office near the beach for a lot more information including coach excursions to other areas & towns of provence. Plus wifi. There are bicycle hire shops in town as well as scooter hire - if required. Boat hire is available too if you can afford it! WiFi is not available in the cottage - BUT can be purchased by the hour/day/week from the tourist information office. Also, there is a good internet cafe on Rue Pierre Curie - 10mins walk, ask for Alex who is helpful and speaks good English. Plus some cafes / bars offer free wifi. Please ask for guidance. The prices quoted are based on two adults sharing. An additional cost of £100 per person per week up to a max of four adults. Changeover Day: Saturday to Saturday. Arrival after 4pm and departure by 11am. Notes on prices: The rates are based on an occupancy of two people. A further charge of 100pounds per week added for each additional person* Max total four people. *£50 pw for children under 11.